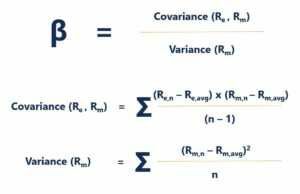 The Beta coefficient is a measure of sensitivity or correlation of a securityMarketable SecuritiesMarketable securities are unrestricted short-term financial instruments that are issued either for equity securities or for debt securities of a publicly listed company. The issuing company creates these instruments for the express purpose of raising funds to further finance business activities and expansion. or investment portfolio to movements in the overall market. We can derive a statistical measure of risk by comparing the returns of an individual security/portfolio to the returns of the overall market and identify the proportion of risk that can be attributed to the market. We can think about unsystematic risk as “stock-specific” risk and systematic risk as “general-market” risk. If we hold only one stock in a portfolio, the return of that stock may vary wildly compared to the average gain or loss of the overall market as reflected by a major stock index such as the S&P 500. However, as we continue adding more to the portfolio, the portfolio’s returns will gradually start more closely resembling the overall market’s returns. As we diversify our portfolio of stocks, the “stock-specific” unsystematic risk is reduced. Systematic riskSystematic RiskSystematic risk is that part of the total risk that is caused by factors beyond the control of a specific company or individual. Systematic risk is caused by factors that are external to the organization. All investments or securities are subject to systematic risk and therefore, it is a non-diversifiable risk. is the underlying risk that affects the entire market. Large changes in macroeconomic variables, such as interest rates, inflation, GDPGDP FormulaThe GDP Formula consists of consumption, government spending, investments, and net exports. We break down the GDP formula into steps in this guide. Gross Domestic Product is the monetary value, in local currency, of all final economic goods and services produced within a country during a specific period of time, or foreign exchange, are changes that impact the broader market and that cannot be avoided through diversification. 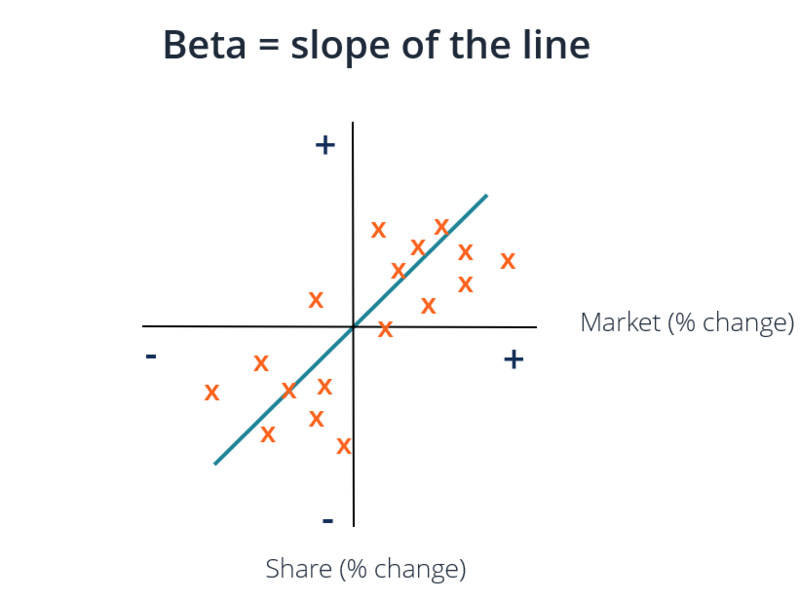 The Beta coefficient relates “general-market” systematic risk to “stock-specific” unsystematic risk by comparing the rate of change between “general-market” and “stock-specific” returns. The Capital Asset Pricing ModelCapital Asset Pricing Model (CAPM)The Capital Asset Pricing Model (CAPM) is a model that describes the relationship between expected return and risk of a security. CAPM formula shows the return of a security is equal to the risk-free return plus a risk premium, based on the beta of that security (or CAPM) describes individual stock returns as a function of the overall market’s returns. An asset is expected to generate at least the risk-free rate of return. If the Beta of an individual stock or portfolio equals 1, then the return of the asset equals the average market return. The Beta coefficient represents the slope of the line of best fit for each Re – Rf (y) and Rm – Rf (x) excess return pair. In the graph above, we plotted excess stock returns over excess market returns to find the line of best fit. However, we observe that this stock has a positive intercept value after accounting for the risk-free rate. This value represents Alpha, or, the additional return expected from the stock when the market return is zero. One of the most popular uses of Beta is to estimate the cost of equity (Re) in valuation models. The CAPM estimates an asset’s Beta based on a single factor, which is the systematic risk of the market. The cost of equity derived by the CAPM reflects a reality in which most investors have diversified portfolios from which unsystematic risk has been successfully diversified away. In general, the CAPM and Beta provide an easy-to-use calculation method that standardizes a risk measure across many companies with varied capital structures and fundamentals. The largest drawback of using Beta is that it relies solely on past returns and does not account for new information that may impact returns in the future. Furthermore, as more return data is gathered over time, the measure of Beta changes, and subsequently, so does the cost of equity. While systematic risk inherent to the market has a meaningful impact in explaining asset returns, it ignores the unsystematic risk factors that are specific to the firm. Eugene Fama and Kenneth French added a size factor and value factor to the CAPM, using firm-specific fundamentals to better describe stock returns. This risk measure is known as the Fama French 3 Factor Model. Valuations and analysis of portfolio investments is critical work for many financial analysts. To learn more about valuation methods and analysis, the following resources may be helpful.